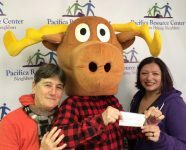 The No On W campaign donated $962 to the Pacifica Resource Center. This amount will be doubled to $1924 because all donations to the Resource Center will be matched, up to a total of $20,000. Mailed donations will be matched if they are postmarked by December 31. The quarry developer must be concerned about the outcome of the Measure W campaign, based on the latest advertisement in the Pacifica Tribune. The Pacifica Tribune published a column introducing the local organization that is opposing Measure W, and describing the many reasons why Pacifica voters should Vote No on W on November 8th.